For many, chalk brings back childhood memories of scribbling figures out on the sidewalk, playing hop scotch in self-made disproportionate boxes, and being saddened each time the rain washes everything away. Today, many professional and amateur artists never leave the driveway. There are many different mediums to work within, but one of the fastest expanding niches of chalk artists transforms the sidewalk into a canvas. Concrete is still king. So what exactly is chalk and where does this stuff come from? Chalk is a form of limestone, a soft, typically white, sedimentary rock. It forms from the accumulation of mineral calcites -which also makes it a porous rock, similar to pumice. This quality can make chalk a challenge to work with, leaving holes and unfilled patches on the canvas or pavement from a seemingly solid and even stroke. Still, chalk has a variety of uses: teachers use it on blackboards, gymnasts use it for grip, pavers use it for painting evenly lined parking spaces, and artists use it in a variety of forms from varying degrees of hard and soft chalks, to chalk pastels and even liquid chalk. Working with the challenge of this porous mineral, artists have envisioned and developed increasingly complex and abstract ideas that have been executed by such famous sidewalk artists as Kurt Wenner. 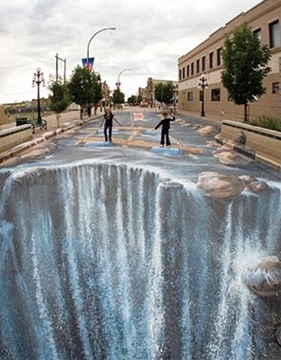 In fact, the work of Wenner and other artists like Ellis Gallagher and Julian Beever have created an overnight cult following in some major cities such as New York, Chicago, and Los Angeles. Their work has been the center of many email chains, sparking interest all across the globe in their incredibly intricate, three-dimensional works of art. Some noteworthy techniques employed by many artists include various approaches to blending and the use of the “Wet Effect”. Dipping or soaking your chalk in a container of water for up to 6 minutes achieves this effect. This softens the chalk, making it malleable enough to work like paint. From here, the possibilities for blending and shading become endless. This entry was posted in 3-d sidewalk art, Artist, Outsider Art, paint by number, Segmation, Sidewalk art and tagged Art, calk art, canvas, Chalk, different mediums of art, Ellis Gallagher, Julian Beever, Kurt Wenner, Los Angeles, sidewalk art, Sidewalk chalk, techniques for chalk artists, wet effect on January 6, 2012 by segmation. That’s so awesome. I love to see the ones that cover an entire street or HUGE sidewalk chalk.